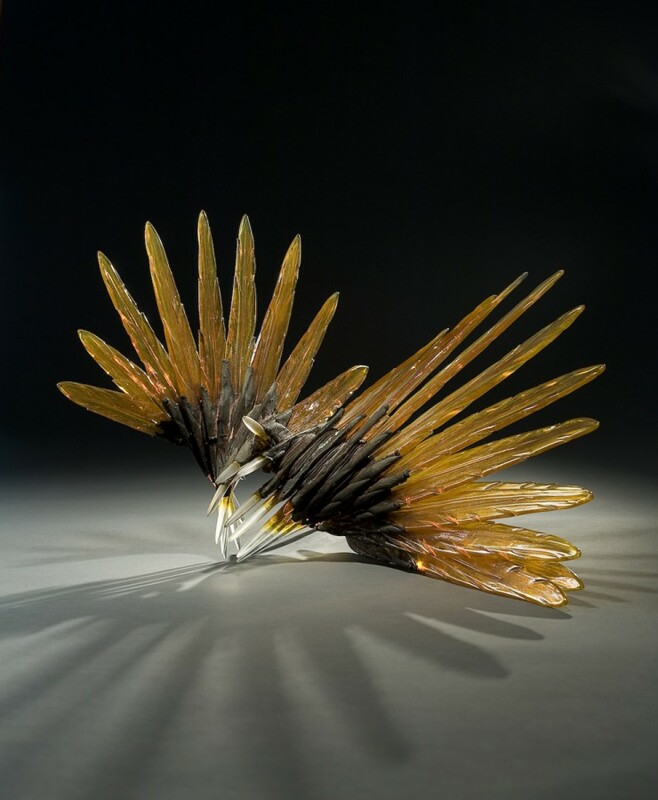 Brian Russell creates one-of-a-kind sculptures from cast glass and forged metals. 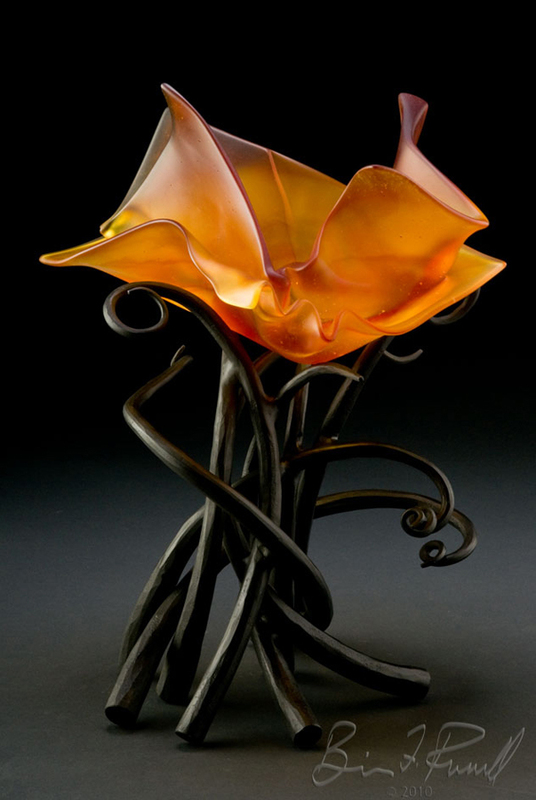 Brian is one of only a few sculptors in the world to have the depth of knowledge to be able to combine both a lost wax glass casting operation and metal forging and fabrication in one studio. 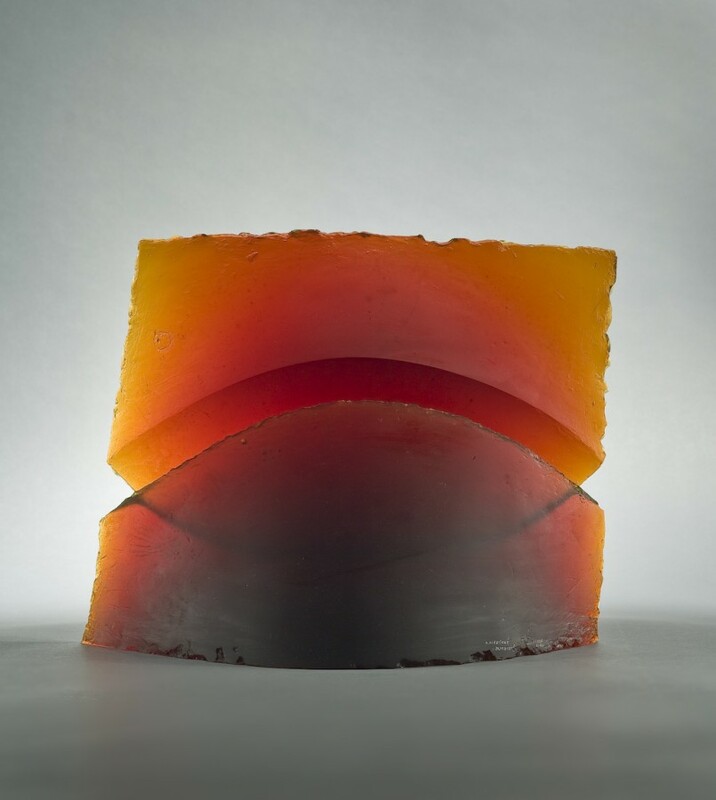 Producing works for both interiors and the landscape on a residential and corporate scale, Brian Russell draws inspiration from the rhythms of nature, ancient artifacts, mathematics, science and, ultimately, his imagination. 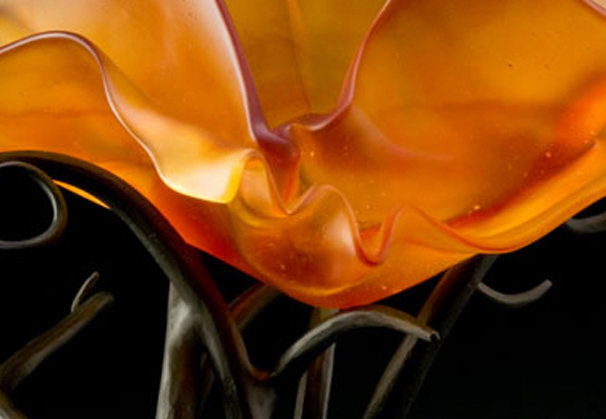 Brian Russell's work is represented in California by Coda Gallery, Palm Desert. 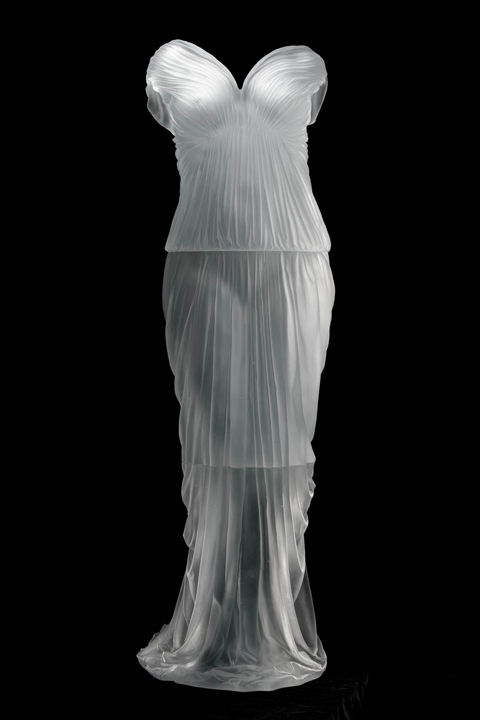 Sculpture is a vital element in our visual environment. The creation of objects that exist in three dimensions whose purpose is to stimulate reflection, meditation, awe and amusement is as unique to humans as it is ancient. I create works that will live harmoniously in the world as independent functionaries of society. I draw inspiration from forms and rhythms in nature, ancient artifacts, mathematics and science, distilling these influences into abstract points of intersection. My aim on a public scale is to involve the viewer, to interject into the world points of beauty, interest and spontaneity. I want people to use my sculpture as an excuse to mentally shift to another level of consciousness, above the daily hubbub, even for a moment, and to reconnect with themselves via that primal, emotional, cortex-controlled spasm of an encounter with an unexpected oasis in a visual desert. 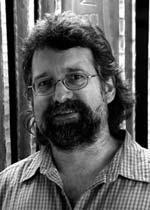 Brian Russell's artistic endeavors began in the late seventies when he started exploring black and white photography. Concentrating on the human form Russell pursued photography as his primary expressive medium until his introduction to sculpture in 1981. Under Lawrence Anthony's instruction at Rhodes College, Russell began to be fascinated with what his hands could create. Beginning with wood and stone carving, he soon progressed to fabricating large freestanding sculptures from scrap steel and industrial debris. Russell spent the year after graduating from Rhodes fashioning welded sculptures in his mother's backyard. At this time he began also to build furniture, both of wood and of steel. Furniture and functional items provided capital for the establishment of his first studio in midtown Memphis in August 1985. Shortly after starting this business, Russell became aware of the creative possibilities of working with hot forged metals. Using the tools and techniques of traditional blacksmiths allowed the shaping of metal into forms matching his creative vision. For the next nine years Russell worked in his studio on Broad Avenue, building everything from fire screens to monumental gates, from sculpture to lighting. Mastering new techniques and materials stimulated his creative vision, each new work allowing a synthesis of ideas. 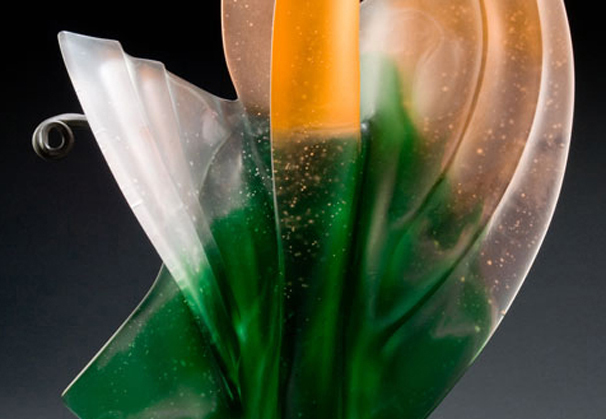 Driven to incorporate color into his work, Russell began experimenting with fused glass and pate-de-verre. 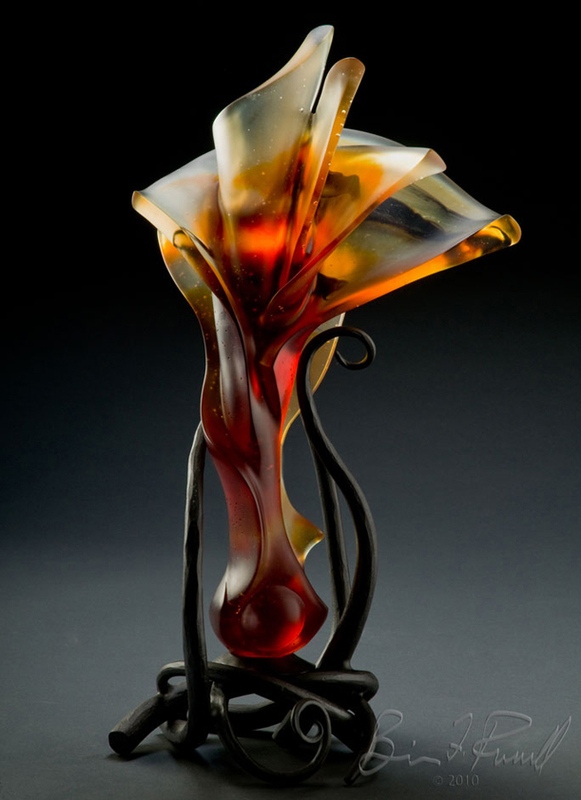 Initially focused on glass vessels and fixtures, Russell laid the foundation for subsequent mixed media sculpture. His visual vocabulary was derived from his travels, nature and the human form. In 1994 Russell moved his studio to 15 acres in the countryside northeast of Memphis. During the next six years, Russell produced an exceptional volume of work, including four commissions for monumental architectural sculptures. 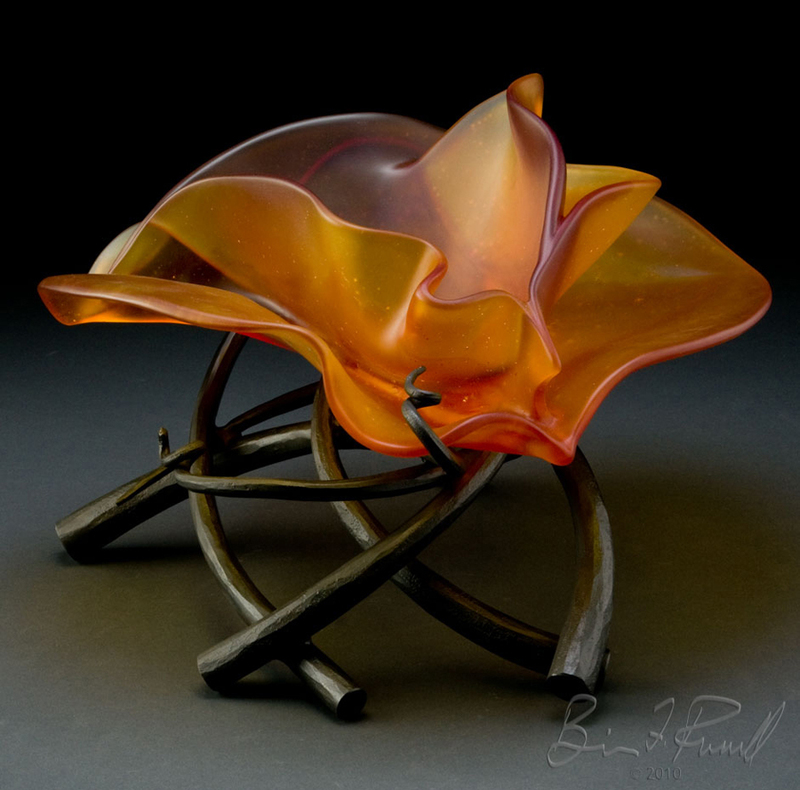 Satisfied with his mastery of forging technique, Russell began to leave the more linear forms driven by blacksmithing and to expand his vocabulary to include more color and volumetric shapes. 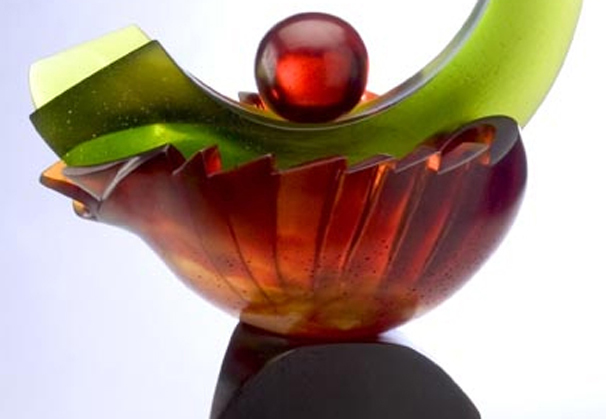 In 1998 Russell decided to reintroduce glass into his work in a more sculptural way. 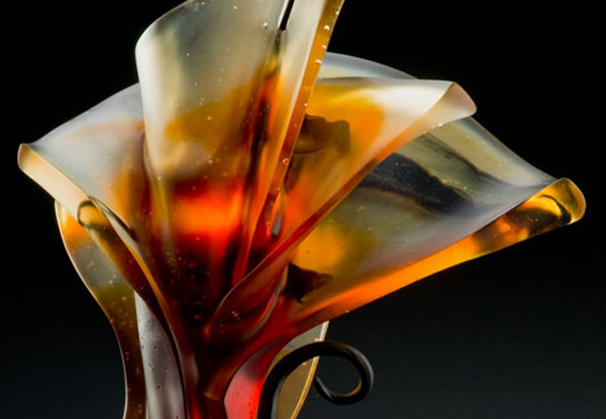 Using a scientific approach, and with much experimentation and patience, Russell was now able to realize his vision of combining glass and metals to create new expressions in his work. Still, the techniques of fusing lacked the crisp sculptural qualities he desired. 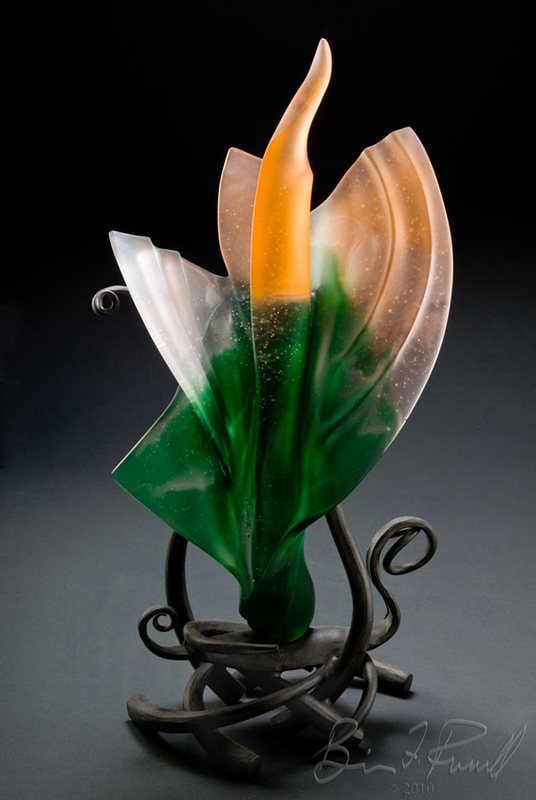 On a visit to New Zealand in 1999 Russell was exposed to a lost wax glass casting technique that produced exciting results. 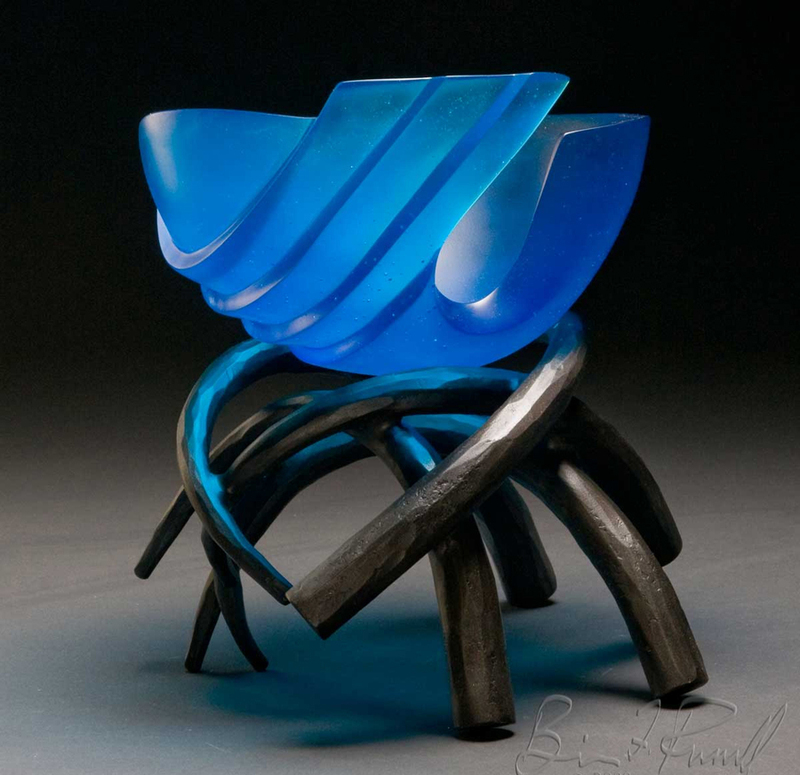 Two more years of hard work and research resulted in the current state of Russell's art: a fusion of forged metals and cast glass unique to his sculpture. A confidence in technique and agility with materials now allows him to fully exploit his creative talents. 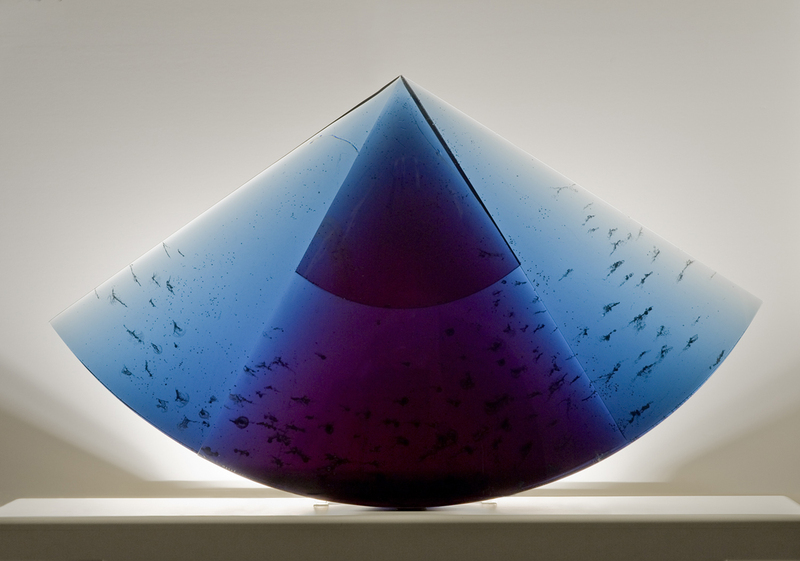 The transparency and optical nature of the colored cast glass have an inherent emotional effect that enable the artist to speak quietly, yet powerfully about his ideas on the nature of reality and purity of form. 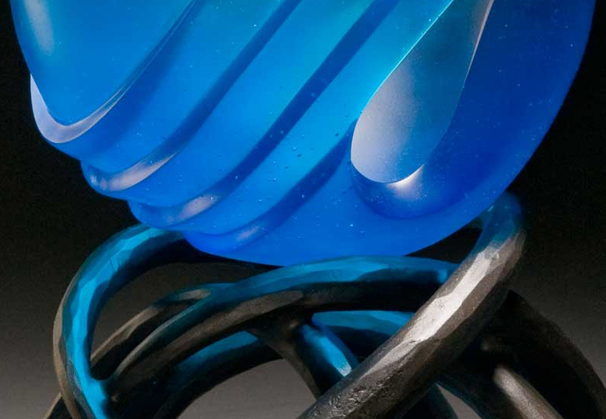 The effect of the metal forgings, synergized with the images presented by the vivid glass castings give life to his sculptures. Since 2004 Russell has been working once again with formed and fabricated sheet bronze forms, as well as forged aluminum. 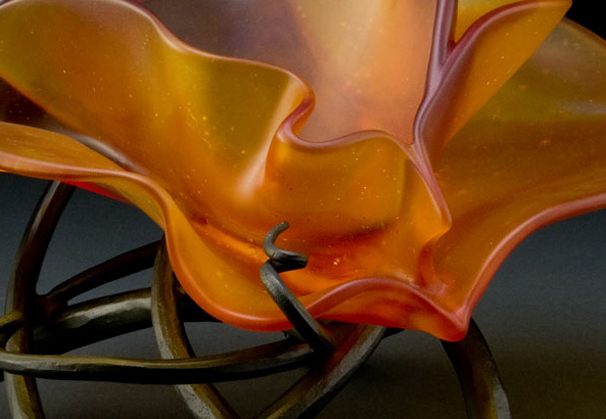 The bronze shapes flow smoothly into the glass castings, giving the effect of unity. The metal work gives scale and structure to the glass. 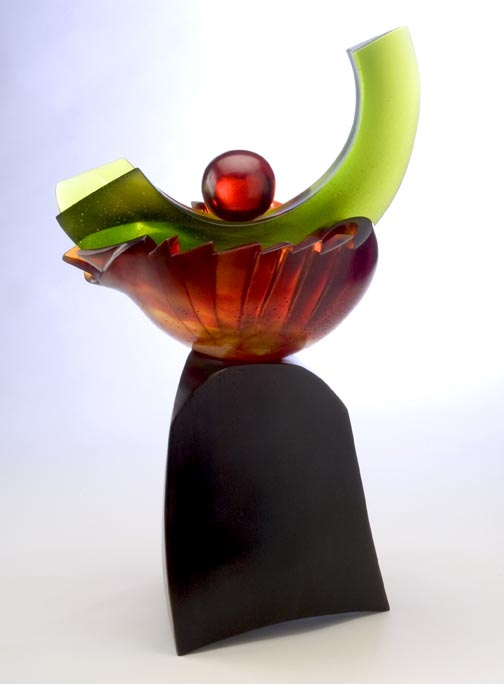 2006 dawned with new explorations into adhesively joining pieces of glass, thus further enlarging the repertoire. 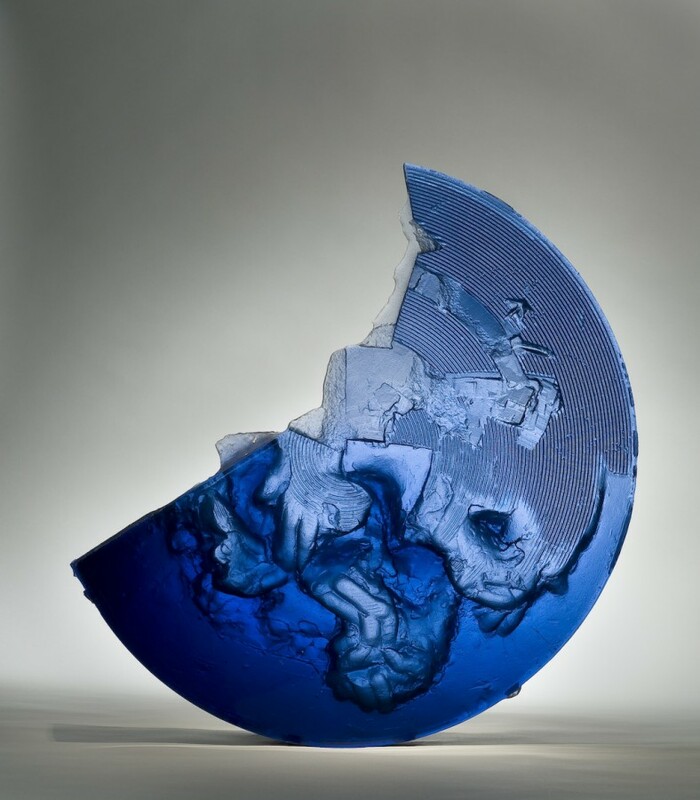 We are grateful to Coda Gallery, Palm Desert, California, for providing the materials for the Artist of the Month.